"These awareness campaigns, if it's cheesy, they won't use it." Peagram is a psychologist who works with more than 30 schools in Illinois to help teachers and students deal with bullying and confrontational behavior — in other words, what most kids would call drama. Much of it is now online, where mercurial, youthful emotions fly at double-speed. "It happens so fast and quickly and it never stops," Peagram says. "Because of the invisible audience online, you think everybody saw that post and it basically becomes mass harassment. ... And when things are really bad, kids, they read all the comments over and over and they can't step away from it." The collective digital community has struggled to catch up with cyberbullying — and how do you? One in four teens told the Pew Research Center they frequently witness people "stirring up drama" on social media, in a study released earlier this year. And according to Pew's similar study from 2011, the most common response to mean behavior on social media is to ignore it. What's a good response when you don't really have something to say? It was the developers picking apart Apple's latest iPhone operating system update who noticed it first: a new, weird emoji that looked like a cross between an eye and a speech bubble. "Nobody knows what it is, or why it exists," emoji guru Jeremy Burge wrote in a blog post in September. This week, we know: It's the first-ever social awareness emoji. Or, as Ad Council CEO Lisa Sherman describes it, a digital arm wrapped around a cyberbullying victim. "When you think about it, the emoji gives teens a way to say something when they don't know what to say," she tells All Tech Considered. The idea of the "I Am A Witness" campaign is to get the invisible bystanders to speak up against mean things on the Web. 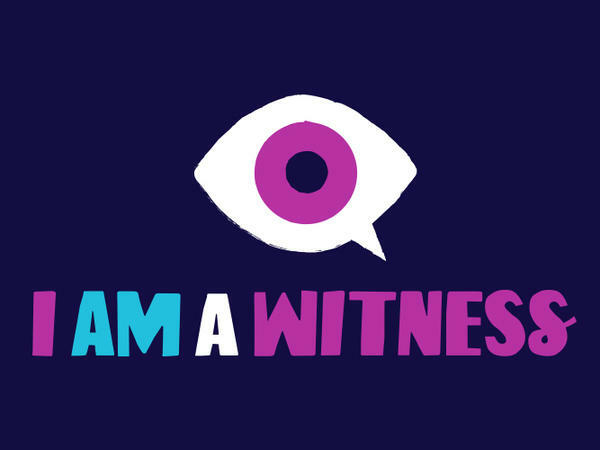 It comes wrapped in all kinds of social media packages: the emoji itself (one of a new batch with the new iOS update), a colorful website with more downloadables (including a special emoji keyboard + stickers), plus pushes on Twitter, Snapchat (ISeeBullying + geo tags + photo filter), Instagram (#IAmAWitness), YouTube and Facebook. The Ad Council has tested the emoji with 30 boys and girls between the ages of 13 and 16 who do a lot of things online and have witnessed cyberbullying over the previous month. The organization tells All Tech that the teens said they were somewhat or very likely to use the emoji keyboard and generally liked the campaign. "I think the missing component is there's no follow-up. ... We're trying to confront bullying, but we're not doing the preventive things, how to be a good citizen online, or what not to post." She says awareness is a big step, but lists off numerous other things it can't replace: not just better education of both victims and bullies but also a better grip on our online lives by teachers, parents and the communities. The social media companies, too, could do a better job handling reports of bad behavior. Still, Peagram says she is curious to ask her students about the campaign.